No no, we don't mean that Mars is fixing the dome! Keep your hard hats on out there. Instead, as we did recently with Templar Assault, the art team is working back over the art for the city of New Boston and redoing sections of it. We are all very excited, because the map art is some of the most visible art and is almost constantly in your face (in moving, combat, etc). 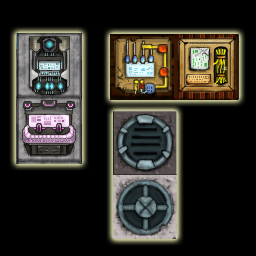 Here are some of the new tiles that are already in the game as of last release, or are on the way there. Keep getting our updates of Cyber Knights to see the city beautification process in action. And we mean "beautification" in a special, dystopian way.